Quinn Rollins: Play Like a Pirate: LEGO Sets of the Month: Mighty Micros!! Up until now, the Play Like a Pirate LEGO Set of the Month has been one set, that I thought was particularly appropriate for classroom use. This month, the Set of the Month is actually three different sets -- that would still be good for classroom use, but I mainly picked because they're so much fun. The Sets of the Month for May are Mighty Micros. They're small, single person vehicles that have a lot of personality. I picked the three DC Comics sets because I'm more of a DC fan than Marvel, and hey. I'm the one giving them away. For free-like. 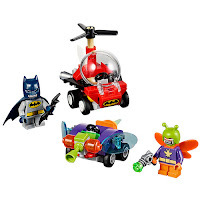 The charm of these sets is in the modified minifigures and their vehicles. The minifigures are smaller than standard LEGO people, with stubby legs that aren't jointed and cartoony faces. In the first series I didn't like the aesthetic, but the more characters I see in that style, the more I dig it. Their costumes are less detailed than regular minifigures, and their faces are over the top. Perfect for the Mario Kart/Wacky Races that could ensue from the vehicles themselves. The vehicles are a lot of fun -- Wonder Woman's is a tiny version of her Invisible Jet, and her rival Doomsday has what I'll politely call a "bone-mobile" even though I taught junior high and I know exactly what I'm saying there. Doomsday himself has grotesque bone spurs growing out of his shoulders and arms and face, so his car does too. Batman's in a Batcopter that owes a lot to the domed version in the 1966 Batman movie (with the Bat-Shark Repellent! ), and Killer Moth's car has a proboscis and a stinger...do moths even have stingers? Wow, I hope not. Killer Moth just got a lot scarier. 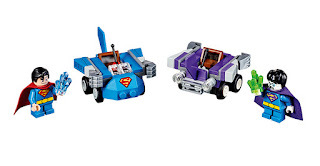 My favorite of the vehicle pairs are Superman and Bizarro. 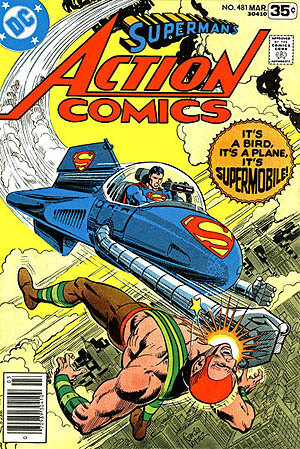 Superman's is based on the Supermobile, a vehicle that was in a few issues of a comic book in 1978. Superman lost his powers and needed some transportation, so got a little spaceship that flies, but also had robot fists on the front of it that could extend out and pop a villain in the face. It was an excuse to sell toys, and both Corgi and Kenner came out with versions of it at some point. Now LEGO is commemorating that ridiculous vehicle with one of its own, complete with tiny silver fists. The part that makes me love this more? 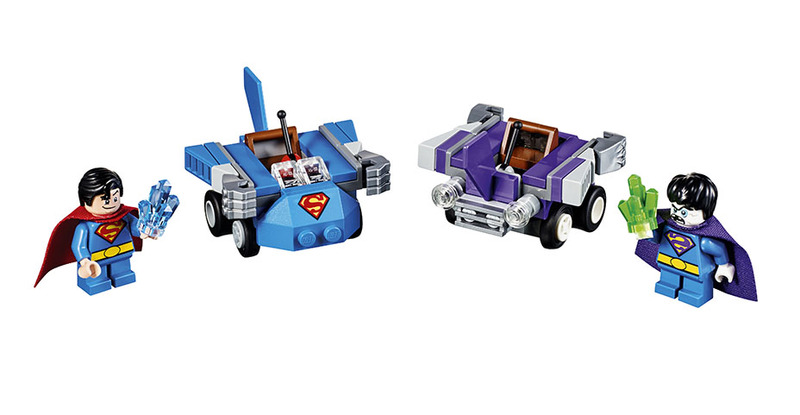 Bizarro's car is exactly the same as the Supermobile, but built backwards and in darker colors. Because...Bizarro. I do see possibilities for the mindset behind these vehicles. 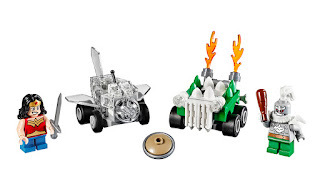 The personality that goes into the cars--especially the villains, with the moth details, the backwards-driving, and the bony protrusions--are similar to the Hot Wheels strategies that I talk about in Play Like a Pirate. The LEGO vehicles are very small, built out of about 40 pieces each. That makes them easy enough to build in a short amount of time. Students could also sketch out the cars (although building them is more fun) and explain the features of the cars. Have the cars represent something from a unit you're teaching; a key concept, a character, an event. The wheel base of the LEGO cars is too wide for an orange Hot Wheels track, but designing a track with obstacles for the characters to overcome would be another good activity -- having students explain what the obstacles represent for the character, and then see if they can overcome it. When it comes down to it, it's May. These are fun. Have fun with your students. SO HOW DO I ENTER TO WIN THESE AMAZING SETS??? Congratulations to Toby Price -- you won the May LEGO Sets of the Month!! 3. Follow @jedikermit on Twitter and retweet this tweet If you're not on The Twitter, you really should be. Sign up just for this entry. And follow me. So worth it. You can follow the #PlayLAP hashtag to see what other people are doing with Play Like a PIRATE. A book you should totally buy. Keto Max Burn can be bought basically by tapping on the symbol underneath. When you click it, a page will show up before you in which you should plainly make reference to your delivery subtleties. Do all these fundamental customs as quickly as time permits to get your bundle in multi week as it were. In addition, you can attempt it for nothing. To become familiar with the preliminary offer, basically experience the terms of utilization. Erozon Max Puede leer más auditorías de otros para investigar más ventajas a medida que las personas las experimentan. Simplemente comparto parte de mi gran experiencia cuando me enfrenté a un artículo de Erozon Max. Al principio, necesito informarles sobre los resultados del diagrama, que es suficiente para demostrar que Erozon Max es uno de los mejores patrocinadores. El artículo Erozon Max puede brindar los mejores resultados y ampliar el nivel de vitalidad de una manera segura y más rápida. Purefit Keto No this item is having components from the unstoppable force of life and does not have any mischief whatsoever. You can counsel your specialists on the off chance that you have any questions. As indicated by its current clients, this item is doing fine and dandy. Where to purchase Purefit Keto?